Heather Corcoran. Six Conversations, 2016. Digital prints, 80 x 20” (horizontal) and 40 x 64” (vertical). Installation view. In the Millstone Gallery of the Center of Creative Arts, Reading Time Across Words and Numbers: Visualization Projects by Heather Corcoran presents an installation of digital prints that navigate the regimes of physical and cultural data, framing the production, observation, or collection of this information as inherently creative responses to many environments that we inhabit. A short introduction on the gallery wall begins by reminding the viewer that “We are awash in data. It is a social condition of our time.” The idea itself is not uncommon, but in designer Heather Corcoran’s heavily liquid phrasing, data is something that saturates and suffuses; it is current and torrent, coursing over all of us equally. The as-yet-untamed power of data continues to offer an almost mythical promise—beckoning like the sea, threatening like the flood. The condition of being “awash” is more just than a convenient metaphor, however, and Corcoran’s visualizations frequently chart the accumulation, depth, path, temperature, or shape of water in a variety of naturally occurring contexts. For several of these projects, water becomes an important measure for understanding our own precarious place within the whole of the world’s data. Cloud Library (2013), for example, meticulously recreates the shapes of clouds that Corcoran observed in the drama of restless vapors above her. In this study of subtle differences, one-off outlines stage a series of implied relationships that conspire and dissolve as though unaware of being watched. Heather Corcoran. Cloud Library, 2013. Digital print, 24 x 30”. Installation view. An especially economical set of visualizations reveals the relationship between atmospheric data and aesthetic experience. July (2010) presents publicly available information on the average wind speed, wave height, air temperature, and water temperature of Lake Michigan at Chicago’s Foster Beach over the course of a month, with corresponding photographs taken at the same time each day. 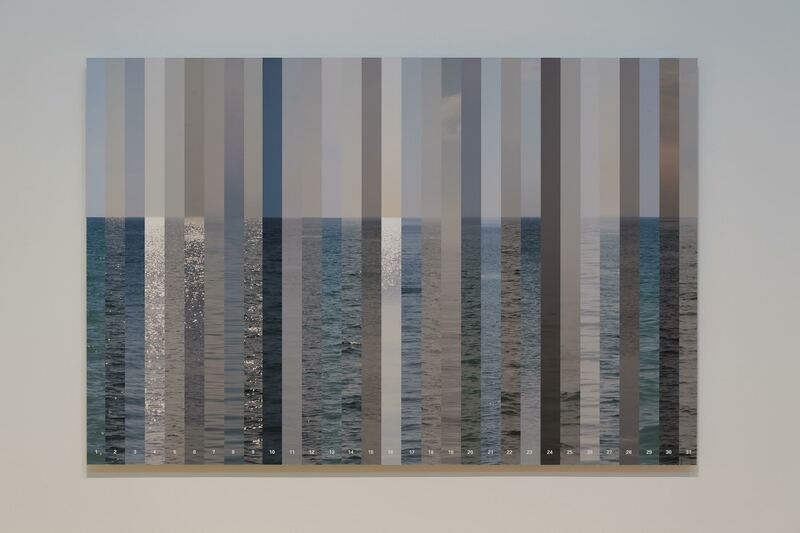 Color of Water (2010) collages an equal section from each of these photographs into a serial, striated horizon. The play of light upon the lake’s waves articulates a spectrum of visual affinities—from blue to grey to richly shimmering white—that we know depends entirely upon the numerical data depicted nearby. A trio of letterpress broadsides pair written texts by Meriwether Lewis, Langston Hughes, and Herman Melville with closely corresponding historical records—the water height, water temperature, and sediment density of the Mississippi River; rainfall in St. Louis; and water temperature just off of Manhattan, respectively. (Melville and Lewis are excerpted, but Hughes’s “April Rain Song” is reproduced in its entirety, with an expertly varied typography that understates some of the more seemingly emphatic lines from the poem.) In each of these intimate works, the rhythmic inventions of language are at once amplified and offset by the documentation of physical conditions that endlessly reshape our environment. Heather Corcoran. Color of Water, 2010. Digital print, 45 x 30”. Installation view. Heather Corcoran. 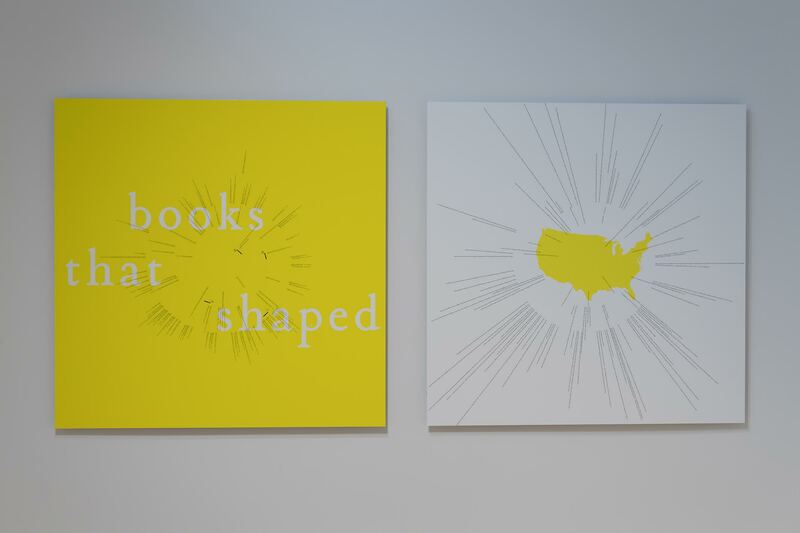 ‘Books That Shaped America’, 2016 (left) and Words That Shaped America, 2016 (right). Digital prints, each 40 x 40”. Installation view. Of Corcoran’s projects in this exhibition, the largest and perhaps most striking is Six Conversations (2016), which quantifies and maps information from six recent short stories by women. Spanning horizontal panels anchored by a shared central index, a lattice of points, lines, and shapes signifies a variety of formal distinctions within each text, such as the ratio of spoken dialogue to running narrative. Corcoran also charts the physical locations of the story—from rooms to relative elevations to the transitions between settings—and provides an alluringly oblique list of words that snapshot each story. These intricate visualizations challenge the traditional activity of reading fiction, liberating it from a uniform and otherwise unremarkable block of text packed tightly into the pages of a paperback or magazine. Yet Six Conversations retains the essential linearity of storytelling, as each text still heaves starboard from beginning to end. With a diagrammatical grace that outlines, counts, and compares as though for the sake and sheer joy of doing so, Six Conversations feels unconcerned with presenting an analysis or positing an argument. Instead, Corcoran spreads the texts open and out like maps upon a table, surveying their uneven narrative topographies from a newly available angle. By design they are hardly neutral—no intervention ever is—but these visualizations nevertheless appeal to the rigors and responsibilities of data collection that one finds elsewhere in the exhibition. They invite us to see patterns both within and among the stories; they are at once a response and a call, a postcard and an invitation. 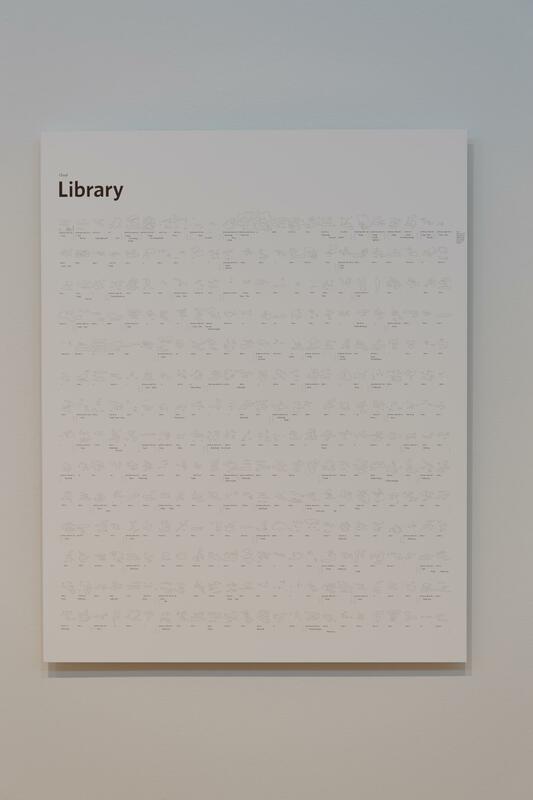 Reading Time Across Words and Numbers: Visualization Projects by Heather Corcoran is on view at the Center of Creative Arts (COCA) in University City, Missouri, from April 1 through May 21, 2016.